Spoilers ahead for Mutiny on the Enterprise! The ship is crippled in orbit around a dangerous, living, breathing planet, and a desperate peace mission to the Orion Arm is stalled. Kirk has never needed his crew more. But a lithe, alien women is casting a spell of pacifism -- and now mutiny -- over the crew. Suddenly Captain Kirk's journey for peace has turned into terrifying war--to retake command of his ship! A very common occurrence in Star Trek is the arrival of an outsider who disrupts the regular day-to-day operations aboard the Enterprise. 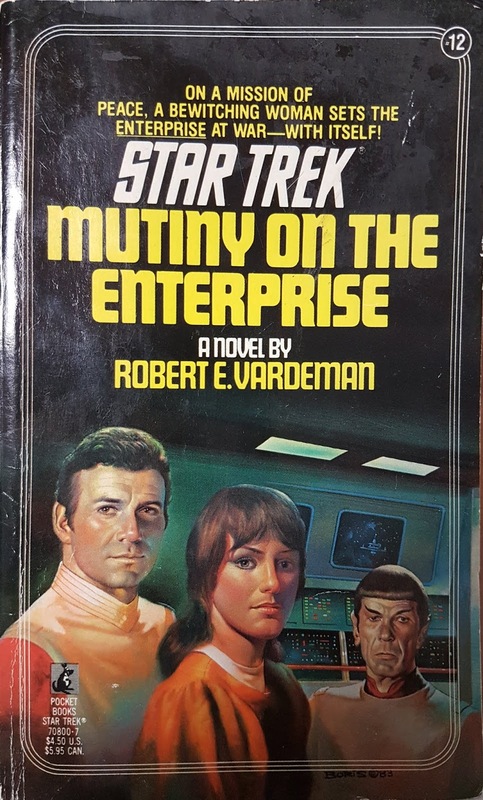 Practically a Trek trope at this point, Mutiny on the Enterprise carries on the tradition with the arrival of Lorelei, whose pacifist philosophy threatens the Enterprise's mission and leads the crew to shirk their duties and effectively commit mutiny. The reason behind her persuasiveness is an almost hypnotic ability to sway people to her way of thinking. The effect on the crew becomes quite profound, even leading Kirk to question their mission. A common Star Trek trope involves the arrival of a person aboard the Enterprise who disrupts the normal functioning of the ship and crew, such as Elaan (pictured). Lorelei fulfills that role in Mutiny on the Enterprise. 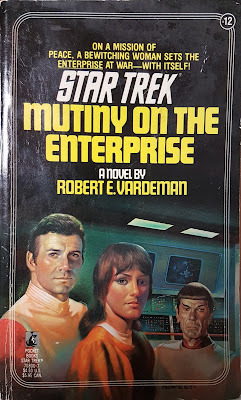 There are some interesting parts in this novel, including a fascinating diplomatic contingent consisting of a typically blustery Federation ambassador along with his aides, which include what seems to be a sentient plant of some sort. There is also a "side quest" to an alien world when the Enterprise's engines are over-strained and damaged, requiring repairs. The crew's attempts to communicate with the inhabitants of the planet are thwarted, until it is finally discovered that the planet itself is one giant organism with whom Lorelei is able to negotiate. While at this point, the idea of a planet being a single organism isn't a unique one, it was fairly well-executed here. Unfortunately, the resolution to the story left a bit to be desired, in my opinion. Lorelei's predictions come to pass, and a shooting war breaks out between Ammdon and Jurnamoria, with the Enterprise caught in the middle. Kirk's ultimate solution is to sit the leaders down with Lorelei, subjecting them to the same persuasiveness that led his own crew to mutiny. While the end result is peace between the two worlds, I can't help but lament the usurpation of the free will of the two planets. 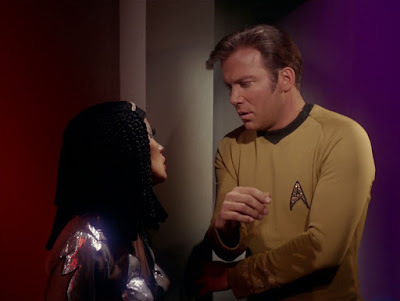 Peace is a laudable outcome, but the leaders are no longer in control of their planets; instead, Kirk has caused them to effectively cede control to Lorelei due to her powers of persuasion. This left a bad taste in my mouth. As for the rest of the story, it's not "bad" per se, but I would categorize it as mostly forgettable. There is nothing here that really "wows" me, and the overall story came across as fairly mediocre. Well-worn Star Trek tropes are employed liberally and mostly competently, but the novel can't escape the feeling that everything is fairly routine. Next up on the never-ending catch-up list is the first book in the Lost Era series: The Sundered by Michael A. Martin and Andy Mangels.